Thursday March 22, 6:00pm, Chamberlayne Heights United Methodist Church 6100 Chamberlayne Rd. The largest interfaith public gathering in RVA! Over 1,200 justice-seekers from dozens of congregations transcend racial, socioeconomic, and religious differences to take action for justice. We hear the stories of those affected by community problems and secure commitments from our local decision-makers to address the root causes. This year, we’re addressing elementary reading in Richmond and Henrico County, childhood trauma in Chesterfield County, and job training in our region. As First Unitarian Universalist Church of Richmond prepares to provide public sanctuary, Adrian Bakker from First UU Church is asking for help with the following items listed here . 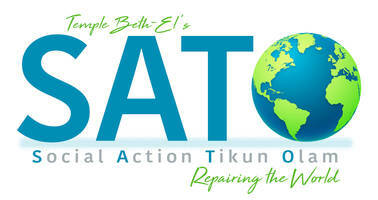 Please note: All Beth-El email subscribers have been added to the SATO email list (one of many!). If you prefer NOT to receive news about SATO, use the button below to tailor your subscriptions. Please send any replies to him at adrian.webb.bakker@gmail.com. Good evening everyone! Now that First Unitarian Universalist Church of Richmond has declared that they will offer physical sanctuary to an individual or family at risk of deportation, we have some work to do to prepare. If anyone can help with any of the following items, please let me know! Bed and furniture donations- Do you have a bed, dresser, television, small table, love seat, or any other furniture that may be useful for our guest(s)? We are trying to generate a list of available pieces so that we can quickly furnish a room to accomodate our guest(s) once we know his/her/their needs. I am hoping that we can have several bed sizes available so that we can accomodate any family size. Medical/Dental care- Are you a dentist, nurse, or physician that would be able to offer your services to our guest(s)? Storage space- Our guest(s) may need storage space to put their belongings while they are living in sanctuary (to avoid paying rent on a vacant apartment/house). Do you have a garage, spare room, or space in your basement that you would be willing to offer? After-hours Companionship- Our guest(s) may be nervous initially about moving into the church or about being alone at nighttime with the risk ICE showing up. If requested, we would like to be able to offer our guest(s) some company. Please consider if this is something that you can contribute if the need arises.